In order to use the CakePHP CAPTCHA Plugin, we have declared Captcha configuration which will be used when loading Captcha component in ContactController. Detailed description of this approach is available in a BotDetect CakePHP 3 integration guide. The Model implements a custom rule and uses a closure for the CaptchaCode field. The closure wraps BotDetect Captcha validation calls and provides the result to the CakePHP Data Validation. The Controller part of the example provides the necessary helpers and data for the View to use, adding Captcha validation functionality as outlined in the BotDetect CakePHP 3 integration guide. After loading the BotDetect Captcha CakePHP component, the $this->request variable is checked to see if the form was submitted or not. The form data is encapsulated in the $this->request->data array, and which the FormHelper creates automatically. 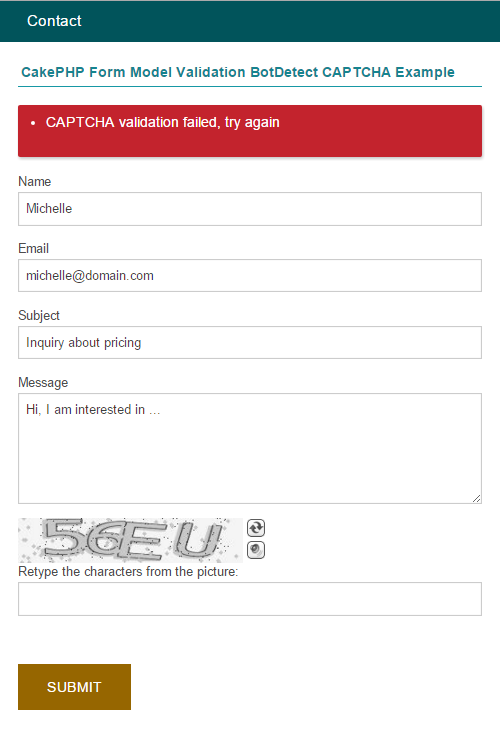 The user-entered Captcha code coresponds to the CaptchaCode field inside that array. Notice that the code proceeds to send the email only if the whole ContactValidator state validates, which includes the Captcha validation result we provided from inside of the model.